Hello. I've actually been on on this site for a long while (Jan 07) but have now just decided to get an account. But I should probably put up a warning first. I have read these forums and seen how requests do tend to get dealt with. WARNING: This request does indeed have anime and video game models intended and hoped for. If the very thought of this makes your blood boil. If the word anime makes you foam at the mouth with an infathomable fury to the point where you will disregard the rules, click the X now. Now then. Now that I haven given my warning, let's move on to the requet. Request #1: Jecht (Final Fantasy 10/Dissidia: Final Fantasy) Click to see the request. This is his appearance in Dissidia, and the main look I'm hoping for. 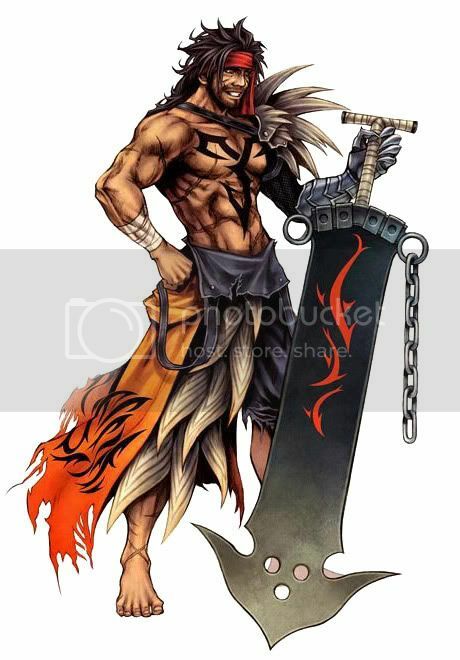 This is Jecht in his original Final Fantasy 10 appearance. The only differences between FFX and Dissidia, is that Dissidia's Jecht has his shorts town along with spikes portruding from his shoulder and waist. My suggestion would be to make his original Final Fantasy X appearance first, then add the Dissidia changes. I would like to see the sword, humourously named the "Jecht Blade" done as well. It is massive, so it should be in two-handed sabers. Perhaps with a medium or heavy only stance add-on. Botfile: To be honest, I can actually do this myself. But if you feel like doing it, I'd prefer if he were highest level in Saber Attack, Defend, with no experience in throwing (Honestly, you can't throw that sword of his). Force-wise, mainly things that will enhance him rather than turn him into a force-throwing maniac. Maybe give him Drain and Grip, but no lightning. Go Heal, Protect, Absorb for light side. Speed is requested. Team-Support: Not required, but would be nice. Simply make the orange part of his shorts blue and red for their respective teams. Sounds: Not required, but would be nice. I suggest taking sounds from Dissidia if you were to give him his own sounds. I may be able to do this myself. Single-Player Support: Not necessary, I don't play the Single-player as I feel it was severely lacking compared to Outcast. 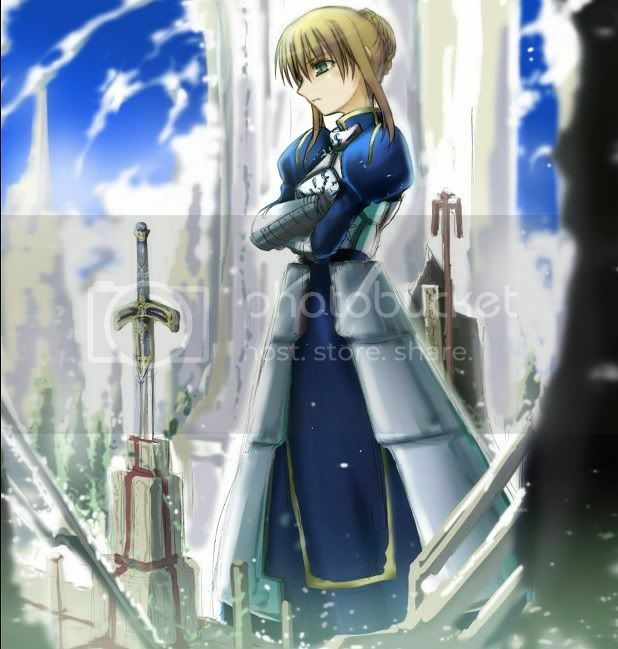 Request #2: Saber (Fate/Stay Night) Click to see the request. This is a base shot of her. It allows you to see a bit from the side. It gives the modeler a good shot of her hair style and the ribbon. The ribbon does not need to flow, at all. Here is a frontal shot of her armored dress. The purple cloth would go over the white in the middle had she not been jumping. Simply texture it on there, no need for a seperate bit of modeling for it. 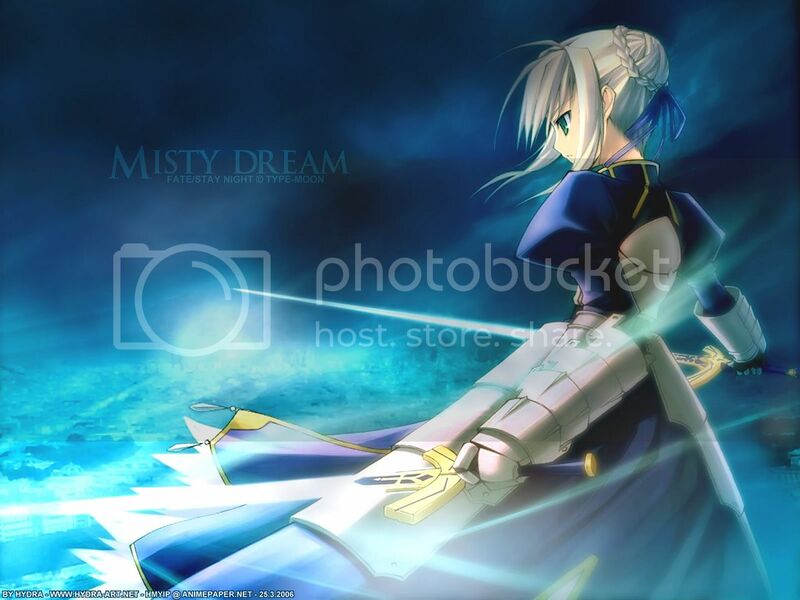 http://i173.photobucket.com/albums/w48/IKARITEAM/FATE%20STAY%20NIGHT/SABER/Saber14.jpg (This will remain a link due to its large picture size.) This is, sadly, the only back shot I could find. I do hope it will help though. I would like to have her sword, Excalibur as well. It's not massive like the Jecht Blade was. 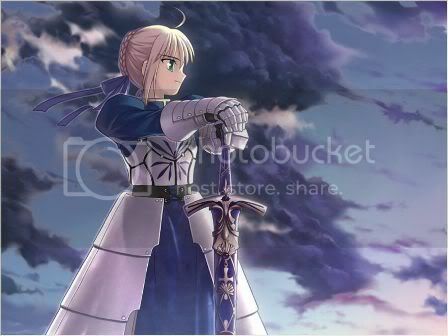 Rather it's about a little over half as long as Saber is tall. 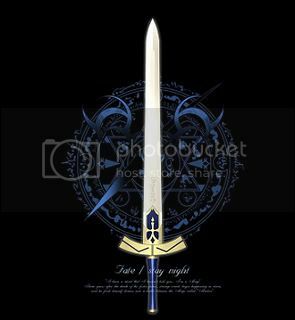 Here is a clear shot of Excalibur, and both sides ARE mirrored, so don't worry about the other side of the blade. I understand the difficulty in making an anime style character, particularly the face. Seeing as there is no need for Single-player support, simply make the face as is. If you'd feel better remaking the face to what you think it would look like in a Jedi Academy style of anatomy (I sound wierd, I know) then by all means, feel free to redo the face. Botfile: Once again, I can do this myself. 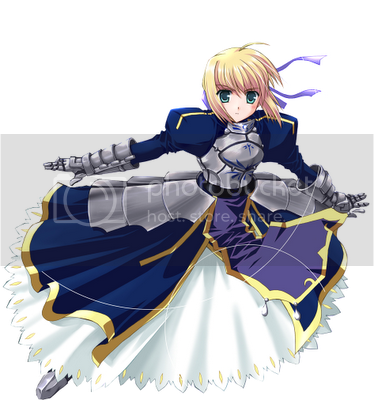 But if you insist on doing it, Saber is a knightly type of fighter, although she is adept and can let off spells of her own. So she would fit mostly on a Light Side force, but she'd be able to use any of its powers. Team Support: Not required, but if you want to make TS, just simply color her blue dress red for red, and have her default look be blue. Sounds: If you want to, I DO have the sounds. However, if not, then I will simply do it myself once it gets released, so there is no need to worry yourself. Single-Player Support: Not needed. To be honest, I am fully aware this is my first post here, so there is no need to point that out. I do know post count tends to help a bit, but I believe the quality of the request goes MUCH farther then post count. I understand that model making doesn't happen just like that. It takes a very long time to get models modeled, textured, rigged, tested and bug free. Time I'm hoping to see these two models done: 1 year. I do hope I'm not asking for a bit too much. =\ If I remember, it took Eclypse around 8 - 10 months to get Kadaj, Yazoo, and Loz done, so I do hope I'm being reasonable. If this request does get taken up: People, PLEASE, for the love of all that is holy, do not bug the modelers making the request. That is one of the biggest factors that make modelers quit! It takes time to make anything decent, and that should be respected. Simply sit in silence and watch the modeler work, giving comments on what they DO show. Please, for their sake, do not ask when it will be done. Final thoughts: I do hope these get done. And I do hope I'm not asking for too much. Thank you for your time, Xiros. =P Wonderful! I'm looking forward to seeing what you can do on this. If I remember, it took Eclypse around 8 - 10 months to get Kadaj, Yazoo, and Loz done, so I do hope I'm being reasonable. Don't consider that normal modeling time. Eclypse had Kadaj handed to him fully-modeled, then somehow took that addition time to complete it. A good modeler can put a model out in about a week. Inyri Forge;4773791Don't consider that normal modeling time. Eclypse had Kadaj handed to him fully-modeled, then somehow took that addition time to complete it. A good modeler can put a model out in about a week.